We recently got a WiiU (thanks, GeekDads). As I hooked it up, I figured that it would let us play some new games – perhaps with better graphics – but I didn’t think it would radically change how I play console games. Boy was I wrong. The core of this change is the WiiU’s new tablet-controller. When I first saw photos of the controller, I figured it would be a huge failure. After all, it was very bulky compared to the Wii’s minimalistic controller. What I didn’t consider, though, was the multi-tasking possibilities. Suppose I want to play Super Mario 3D World, but B wants to watch The Colbert Report. Previously, our only option that would let both of us do what we wanted would be having B go into the bedroom to watch. Now, however, I can use the WiiU tablet controller’s screen to play a game while B uses the TV to watch a show. In addition, thanks to the tablet controller having a headphone jack, I can listen to my game without bothering B as she watches her show. The downside to this? Games are now much easier to pick up and play on a whim. For example, as I try to write this, the tablet controller is beckoning me to play just one more level of Super Mario 3D World. I can see this becoming a dangerous addiction. 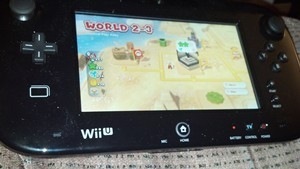 NOTE: I won the WiiU and Super Mario 3D World from a GeekDads giveaway. However, I wasn’t asked to blog about it at all. I just felt like writing about it.